Do you have a job or a gig? With elections coming up we are hearing more talk about raising the minimum wage. In Chicago, Mayor Rahm Emanuel advocates $13 per hour. Seattle is phasing in a $15 rate. New York’s left wing Mayor, Di Blasio is blathering on for the need to lift it substantially in the city. President Obama obviously is promoting it as a good way to save the Democratic majority in the Senate in 2014. My do-gooder side sympathizes with the plight of the $8 an hour worker cutting lawns or flipping burgers. But the sad fact is that a significantly higher minimum wage in America will mean fewer workers with full-time jobs and ultimately just fewer workers. The anomaly of America’s workforce is that we have an estimated 4 million unfilled jobs. Try to hire a drywaller, a screw machine setup person, or a machine tool rebuilder. You probably won’t get a bite, even at $25 per hour. Sure, there will be a disgruntled person looking for a change, or a refugee from a failed company, but there is no steady flow of qualified people to draw upon. This makes it difficult to grow businesses without an in-house training program, which is an expensive luxury for most firms. The interesting trend that I see taking root in the U.S. is the skilled person becoming a travelling professional, selling his skills to the highest bidder. The Hydromat or multi-spindle setup person or rebuilder will ultimately command $75 – $125 per hour as scarcity drives the price up. They may well earn more than the company owner, but they will be “hired guns” brought in only for as long as needed. We are seeing this already with organizing websites like Uber, which is known for providing rides from point to point, but the concept works for all sorts of tasks requiring particular skills or tools. The part-time workforce manned by entrepreneurial specialists skirts the health insurance-by-employer model that has become the norm in recent decades. Businesses will increasingly maintain a small core of daily employees, but that core will shrink as the pool of specialists increases. As I see it, the low-end jobs will consistently be filled by machines. The trend will speed up all the faster as we raise the minimum wage. If we continue to make 30-hours per week the threshold for benefits, companies will spread the work with 29-hour per week people. The spread between richer and poorer will become more pronounced. One beneficiary may well be the armed forces, which will become a significant work option for young people who do not like their civilian job options. The American educational system is starting to adapt to this new normal, but the institutional biases toward a 1960s style of education still prevails in high school and colleges. We are not getting enough even moderately skilled blue collar workers, whether it be drywallers, plumbers or machinery rebuilders to re-supply the workforce needs. But the hopeful element I see today is the potential visibility of entrepreneurial specialists, organized by entrepreneurial web sites. This will pull more smart folks into overlooked but increasingly well paid gigs. This is why Uber, the archetype of this approach, has a value of $17 billion based on current venture capital funding. Times are changing. The $13 minimum wage will be irrelevant in the long run. Question: Will a significant change in the minimum wage change your economic life? Read an interesting piece about women breaking into the taxi industry with Uber at The Atlantic. I have gigs and wouldn’t want it any other way. When you’re efficient being forced to be somewhere a set amount of hours can be boring and frustrating. I like to do my work, do it well, and move on to other things. Having a salaried position isn’t conducive to that. I like to be paid for what I accomplish. I think it’s more transparent for my employer and keeps me honest too. We both know exactly what we’re getting. I think you put too much faith in an “Uber-like” workforce of the future. Services like Uber will ultimately force the price of labor to the floor. Imagine the machining company looking for a skilled set-up person and having a choice of candidates because to get work they all need to “register” with an “Uber-like” service to gain employment. They will be bidding against each other for work. Machine tool programming may even be outsourced to other countries much like other services are being done now. The point is that a free market for labor will never be good for US workers. Greater technology will force wages down, not up. The only thing that will save us from the strength of capital is minimum wages and labor unions. There you go… the golden egg isn’t big enough? Wring that gooses neck until it drops a bigger one. That always works right? Communism is so much better! Just ask all the poor saps in Cuba, Venezuela, China and the former (and future) Soviet block countries about what a swell deal that is. Communism vs. Capitalism isn’t an either/or proposition. While Marxism is completely utopian and incompatible with human behavior, we also need to avoid Dickensian Capitalism. Macroeconomics dictates that a consumer economy requires a middle class capable of being consumers, a social safety net, access to affordable education, and a wage capable of sustaining a healthy family. Impossible? Not in Germany, Switzerland, or Sweden. I wouldn’t put it that harshly to play the communist card, but honestly, labor unions? An idea whose time has come and gone. America has always had a problem of not enough people to do all the work that needs to be done. That is why there is so much immigration (think of it as a differential pressure). That is what drives productivity improvements. And productivity improvements is what drives increased wages. Something we (I) have not seen much of in the past five years. Higher minimum wages totally destroy the economics of entry level labor. Do I feel sorry for the $8 / hour grocery bagger? Not if they are a teenager. Sorry for the 30 something who never had the motivation to do more with their life. Sorry for the 60 something who is just trying to pay bills because that is where I may be someday. My hamburgers will probably cost more. Extra cheese will probably cost a dollar then, too. If the minimum wage is raised to what is considered a living wage, that will support a parent and children, expect prices of good and serices to likewise rise, resulting in a net zero sum gain. This is exactly how a wage and price spiral is started. Entry level jobs are exactly that. They are meant for teenagers entering the work force for the first time and are not meant as a career option. Climbing the social ladder entails obtaining a higher education and advanced training, whether it is through a technical school or college. On the job training is becoming extinct. Every time that we artificially move wages up the scale, there extremely high costs down the road that affect every facet of the economy. You think we would have learned by now. Minimum wages, price controls,rent controls and union wages all fly in the face of what this country was built on. This is the shadow of communism. I pray for hope and change.Lol. It sounds like your mocking your religion… the concept of prayer is not to be used in jest… any atheist would tell you that. I am sure everyone has seen the price of fast food go up. Imagine the guys in the boardroom at your favorite provider saying “sure, I’ll give them a dollar an hour more but I will raise the price of every burger a dollar and make millions.” It will be worse than a zero sum game for anyone who didn’t have the discipline to get an education. Our parents drilled us and we drilled our kids and everyone seems to be doing Ok, or well above the poverty curve. One problem we see is that if you work the welfare system, you can get nearly 60K a year out of welfare with food cards and the like. That sets a high bar, so far beyond what one can do with 2 minimum wage jobs. That alone really needs to be a topic in itself. It is a bad disincentive for an already less than motivated individual for sure. I for one am growing tired of subsidizing multi-billion dollar corporations (Wal-Mart / McDonalds and such) by providing food stamps / healthcare / subsidized housing etc. for their employees while they wile away in the money. Most of the anti-minimum wage increase people that I’ve heard from suggest that low wage earners are generally not smart or lazy people. I’ve worked with good earners whom many fall directly into these camps… and on the other side, I’ve observed few workers standing around Wal-Mart / McDonalds chit-chatting. I would recommend the book ‘Nickeled and Dimed’ for someone wanting an inside look at the low-wage lifestyle… summary: those who work the hardest (physically) earn the least… not universally but generally… and to answer Lloyd’s question… we all have gigs in today’s economics… we just don’t acknowledge it because we like to believe we’re secure. Ultimately things will cost more and our global competitiveness will further deteriorate. The only winner will be the spike in consumer spending which will only last until the prices catch up and then everyone – including the minimum wage earner – will pay more than the wage increase out in additional costs. Just a vicious circle used by those involved in politics on the less informed to forward the agenda of the politicians while exploiting those with a lack of knowledge. Don’t look for our news media to expound the facts, facts don’t sell well unless they can be twisted for shock value. While I have sympathy for the $8.00/hr worker I have not seen very many of them trying to improve themselves through training and education. I am the manufacturing manager at a small company that promotes education and provides the means for our associates to attend classes related to their field. I also sit on an advisory board with the community college for machine tool technology. Over the past several years I have seen an increase with individuals wanting to learn a trade or improve their skills that are veterans. Very few non military individuals sign up for these classes and complete them. Even within our company there are associate who have the opportunity to get additional training yet lack the initiative to actually sign up and attend whether they are making 12 dollars or 20 dollars an hour. The reality is that not every $12 – $15 an hour non skilled position is cost effective for an employer. If you force employers to pay this kind of hourly rate you only force them to raise the cost of doing business or find alternate means of increasing output by automation. As employers lean more towards automation you then stand the change of actually reducing the skilled and non skilled workforce and creating less job opportunities. So what if we did raise the hourly rate to the $12- $15 dollar mark? At what point does this wage then have the impact of an $8 an hour as the cost of business and living increases by the same amount? Your column ironically answers its’ own question. 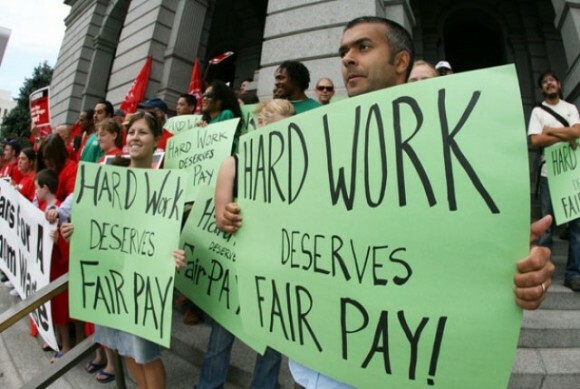 The picture you used shows people holding signs proclaiming “Hard Work deserves Fair Pay!” and then you go on to talk about flipping burgers and cutting lawns. Unskilled, low stress jobs (i.e. golfing in Martha’s Vineyard) are are simply not worth much more than the current minimum wage. Earnings, to use a self explanatory term, like your machines, tend to rise (or fall) with the value they bring to the table. Artificially inflating wages will create a very real inflation in prices, a loss of jobs, and ultimately hurt the people it was meant to help. Real nice Rob… how would you like it if your boss denied your wage increase and told you it is for your own good? Bottom line people; no one gets anything fro free: prices will raise; rents will increase; insurance will skyrocket, etc., etc., Everyone will think that everyone has more money to spend, therefore; lets take it from them before they (gasp!) save some. Economics dictate the minimum wage of areas; supply and demand. In our state (Utah)rarely anyone gets away paying minimum wage; no one will apply with them. Even the Mcdonalds and Walt marts have to pony up a lot more to entice people to work there. Benefits and overtime pay go a whole lot more that increasing minimum wage. Just what this country dos’t need right now more fuel for the entitlement trap. I operate a small company with 12 employees, and what we have seen in the last few years would only accelerate. The higher wages dictated would result in more tax money collected which would open the door for increasing the handouts to any group the powers in the central government wish to propagate for dependent voters, thus increasing their power . The increased burden of already committed funding for social programs has put the country in technical bankruptcy with no hope of ever paying it back. I think the elitists actually believe that this step will generate hyper-inflation that will allow them to payoff enough of the debt to keep the ball rolling. But the result more likely is a massively increased dependent poverty class, more social unrest and a bleak future for all. what ever happened to Adam Smith? Years ago I was sitting in a rather nice office of a large automotive concern in Flint Michigan while the all knowing person on the other side of the desk told me under no uncertain terms that: “Prices Can Only Go Down”. I was so glad to hear this that I asked him to put it in writing, since I was going that very weekend to buy a truck from their (formerly) parent company & wanted last year’s pricing & not this year’s pricing. Obviously the way they got around & drove down labor costs was by going to China, Vietnam & S. America. “Shockingly” – so did their customer base. Now we are left with a high proportion of minimum wage type jobs & more than enough people to fill them, while people needing living wage work & are forced into minimum wage jobs to get by. Thus – they must push that job’s pay as high as they can get it for survival. No real big mystery here. But it sure warps perspective. A higher minimum wage isn’t the answer – higher earning level work/jobs/productivity is. Competition is still the answer – national central planning is not. Lot’s of history says so. If we raise the minimum wage to $12 or $15 an hour what happens to those already earning those wages? Wouldn’t you expect their wages to increase also? I believe the only thing that will happen if the minimum wage increases is that all prices will move with it, no net gain just inflation.